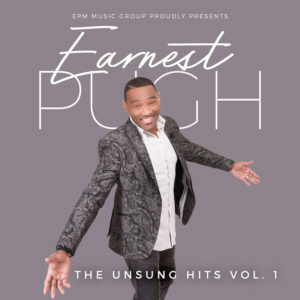 Powerhouse gospel music vocalist, Earnest Pugh, will release, The UnSung Hits Vol. 1 (EPM Music Group/ Entertainment One), on September 7th. It’s an album of previously un-promoted recordings that were created over the course of his two decades long career. “The Unsung Hits,” is a ten-track collection of songs not only highlight Pugh’s remarkable voice but also the sincere and heartfelt lyrics that have been inspiring his audiences. The set also features duets with some of gospel music’s leading and legendary voices, such as Bishop Rance Allen, Vanessa Bell Armstrong, D’Atra Hicks and Michelle Prather. The tracks were crafted by esteemed producers such as Grammy® Award winner Cedric Thompson, Michael Bereal and Keith Williams. Dr. Earnest Pugh is the CEO of EPM Music Group and a veteran gospel recording artist with 11 Billboard Top 30 Singles, including two #1 smashes, “Rain on Us” and “I Need Your Glory.” An active artist on the Blacks Smoke Music Worldwide label, Pugh performs in multiple cities each week. A worship leader at his core, Pugh is the Senior Worship Leader at Village of Faith Church in Richmond, VA. He also serves as CEO of VER, a non-profit agency focused on meeting the essential needs of veterans. This entry was posted in Gospel, Reviews and tagged EARNEST PUGH, The UnSung Hits Vol. 1 by Kris Patrick. Bookmark the permalink.